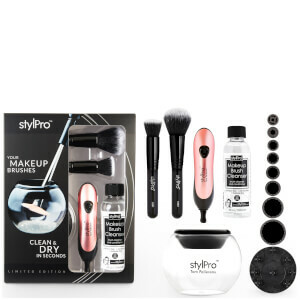 Take the chore out of cleaning your makeup brushes with the StylPro Limited Makeup Brush Cleaner Gift Set, a revolutionary brush cleaning device that cleans and dries your makeup brushes in 30 seconds. Professionals recommend cleaning your makeup brushes once a week. Taking the effort and fuss out of this laborious task, the innovative brush cleaner uses centrifugal spin technology to expertly clean and dry your brushes in no time at all. 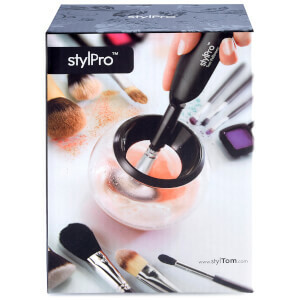 Maintaining all the benefits of the StylPro Original, the StylPro Limited comes in a limited edition colour and introduces a new shape, integral connection spindle and on/off switch, making it even more ergonomic and user friendly. Brushes are ready to use immediately after removing from the device. No more messy basins and overnight drying. 3. For water-soluble makeup (for example: blusher, bronzer and loose powder), squeeze a small amount your preferred liquid soap into the bowl. Add water to the bowl until the water level is half the height of the brush bristles. For non-water soluble makeup (for example foundation), add one sachet (10ml) of StylPro Makeup Brush Cleanser into the bowl. I'm normally particularly lazy with cleaning my make up brushes however I have no excuse now as its so simple and easy. My brushes are clean and dry within minutes! I highly recommend this product! Just tried this brush cleaner set last night - it's a life changer! So easy and quick to use, my brushes look like brand new again. Honestly recommend this set, especially for ladies with acne skin - this set cleans brushes very well and prevents from any bacterias. This worked perfectly, so easy to use and leaves brushes clean AND dry in seconds, this has saved me so much mess and time, I would highly recommend. I absolutely love my brush cleaner, it has literally changed my life! No more washing my brushes and putting them on the radiator to dry - I now clean my brushes once a week with ease, whereas before I would have to wait 1-2 months between cleans. I have noticed that my skin has also massively benefited! Can honestly say i was unbelievably surprised by this product. It works wonders! Easy to use, brushes come out smooth, dry and clean. Couldn't be happier to have found this brand and would recommend to anyone!